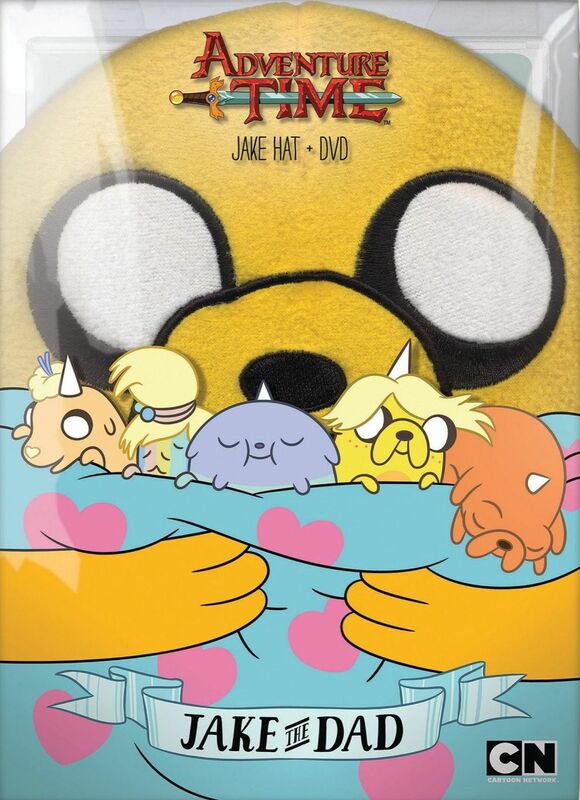 The first thing you'll notice about the Adventure Time: Jake the Dad DVD is that it comes packed with free Jake hat, as there's not really a way to miss it since it's packed in a clear plastic case directly in front of the DVD. It's a pretty neat hat, though it's different than the other Jake hat I've seen around. This one attaches under your neck with Velcro while the one I've see elsewhere has these tassel things which hang down on the sides. It's a cool pack-in, but I really don't see myself wearing it out much. The DVD contains a mix of sixteen episodes from seasons four and five of the series, including the season 5 episode titled Jake the Dad. Based on the title of the DVD I really thought these episodes would focus on Jake and him being a dad, but that turned out to not be the case. They just named it after the first episode the put on the DVD. So setting the title aside, these episodes are all pretty enjoyable and focus on various characters of the show. If you're unfamiliar with the show, check out my review of Adventure Time: The Complete First & Second Seasons, because it's a show worth checking out. It's a bizarre world with weird characters everywhere you look such a stretchy shape-shifting dog, a walking-talking videogame console, a small yellow-green talking elephant that likes to bake apple pies, and more. There's also a special feature called Little Did You Know which gives various character profiles. I would have like a bit more special feature content like a behind-the-scenes featurette or something, but it's still an enjoyable release and the cool hat pack-in is like an extra feature that you can wear.